July's Vanity Trove is making a buzz because it's a collaboration with TANGS, a leading Singapore-based retailer of luxury beauty products. With a top tier collaboration, you know this month's upcoming Trove is bound to be a good one! Tangs, of course, is all about luxury, so Vanity Trove's July offering reflects that too. Tangs, for example, is the exclusive retailer of brands like Red Flower (a high end line of spa products) and Intelligent Nutrients (which apparently has a shampoo pure enough to drink), so some of the brands you'll find in this month's Vanity Trove will reflect that - you'll be seeing some products in your Trove that are exclusive to Tangs, too. Each Vanity Trove will vary, but the brands I've seen in July's upcoming boxes will include a whole range of high-end brands. These include SKII, Shiseido, Laneige, Enavose (I've reviewed their Black Tea Quench Mask and Micellar Cleansing Water before), OPI, Chloe, Clarins, and Ferragamo. Anyway, let me show you what's in my Trove. I got a Trove that was more skincare-centric, which is fine by me. Other girls got Troves that had more perfume or other brands. You can see a shot below. As you can tell, there are also more samples in this Trove than your average Vanity Trove. Great! Let's take a quick run-through of the Trove contents, shall we? I'll go by brand this time. Let's start with the Japanese brands! There's SK-II, with their Facial Treatment Gentle Cleanser and Clear Lotion. 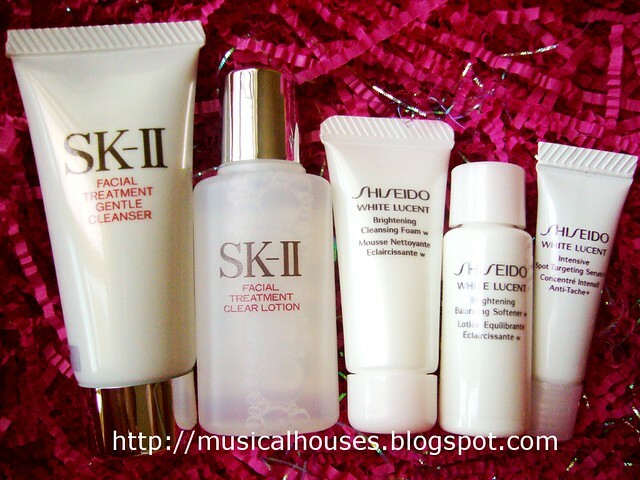 SK-II is pretty expensive, so it's quite rare to find brands like these in beauty boxes. Shiseido also provides three samples from their White Lucent range, which will be really popular among girls who love whitening products. There's a cleansing foam, softener, and a serum. Now, for the Western brands. 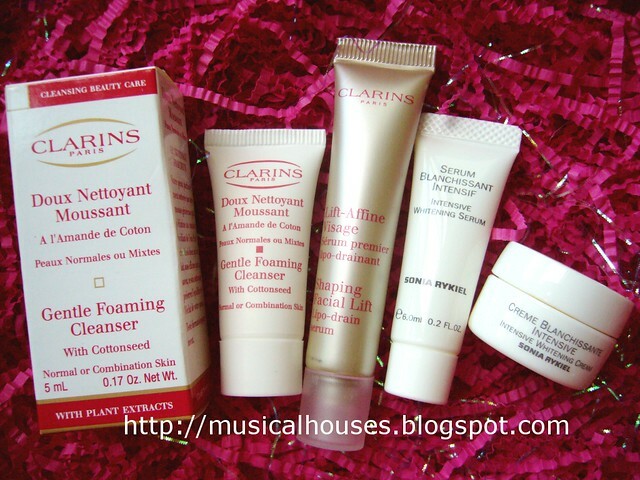 There's Clarins, with samples of their Gentle Foaming Cleanser and Shaping Facial Lift. And there's also Sonia Rykiel, which is a new-to-me brand. Two very popular products are in there - an Intensive Whitening Serum and Intensive Whitening Cream. I've never tried Sonia Rykiel, so I can't wait to try this! Next, the Korean brand! 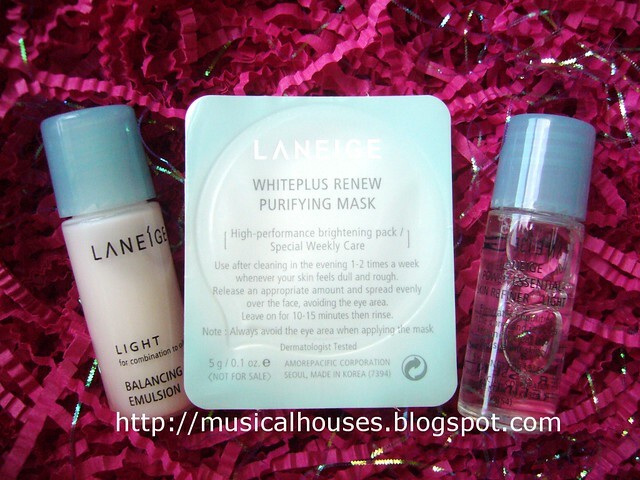 That's Laneige, already a mainstay of most Asian girls' skincare wardrobes. There's a Balancing Emulsion (Light) for Normal/Oily skin (hurray, right down to my skin type), Skin Refiner (also Light for Normal/Oily skin), and a Whiteplus Renew Purifying Mask. I've never tried any of these three products, so it's also good for me. And finally, non-skincare! 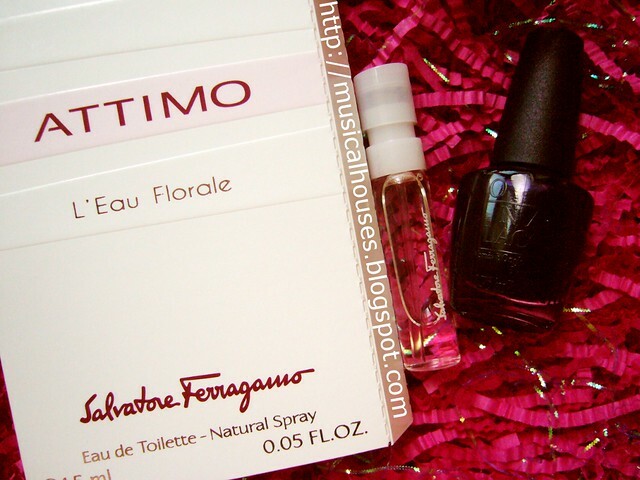 We have a small sample of Attimo by Salvatore Ferragamo, as well as a tiny OPI mini! I don't know what colour this is (deep blurple with shimmer), but it's cool. I love nail polishes, so any nail polish is bound to make me happy. In addition to the products, we also had a bunch of discount coupons which are pretty cool. Some are discounts, some are free sessions at fitness centers, and some are more of services, like skincare consultations and the like. When I spoke to the Vanity Trove folks, they shared with me that they really made an effort to ensure that the products and services in the coupons were really top-of-the-range, and in some cases, even award-winning! Obviously, July's Tangs Vanity Trove really reflects the efforts of the Vanity Trove team to include a variety of brands, and have as many high-end brand samples in the box. So if you're looking forward to trying a range of skincare from different high-end brands all over the world, and don't mind lots of smaller samples, this is for you. After all, variety is the spice of life, and when you're shopping at Tangs, it's part of the experience, and part of this month's Vanity Trove is really to recreate that experience for the suscriber. I'm a new subscriber of VT. i googled for the previous boxes and came to your blog. omg...i wish the next box is as awesome as this one.